Lascia che i tuoi problemi scivolino via con un soggiorno in questa tranquilla cabina. Godetevi i comfort e l'intrattenimento moderni, una posizione che bilancia la privacy e la convenienza e il miglior tramonto nel San Juans. Le spiagge di ciottoli della spiaggia di Otis Perkins sono a pochi passi dalla baita, con la raccolta delle bacche estive in arrivo. I negozi e i ristoranti del Lopez Village distano pochi minuti in auto. Grazie alle ridotte dimensioni dell'isola, sei raramente a più di 15 minuti di auto dalle attrazioni locali. Goditi fantastici panorami a Watmough Head, tidepool a Shark Reef, o clamming a Spencer's Spit. Note sul parcheggio: Si prega di verificare le condizioni meteorologiche prima di guidare. In rare occasioni, la neve aderisce al suolo, rendendo necessario un 4x4 / AWD. A view that keeps on giving from the glorious orange sunsets, to the bald eagles, to the star gazing extravaganza. One of the most beautiful views. We loved this place. The size was just right for two, the kitchen was well stocked with pans, utensils, etc. The shower head was wonderful, the bed comfortable. We loved the mud room entryway for shoes and coats. Just a great experience. Hope to come again. Loved this little house - so cozy and amazing view. Perfect location! Great waterfront views and wonderful location for our bike trip! We loved the location and privacy of this home, perfect for our three day bike-packing trip on the island. It is a quick bike ride from the village where you can stock up on food for your stay or head to for a meal if you want to dine out. It's fairly central if you plan on visiting different spots on the island, especially ideal for anyone planning to get around the island via bikes like we did! One warning: no coffee on site (plenty of coffee filters), so be sure to bring your own! Otherwise the kitchen is set up for your use. The house itself is cozy and clean, with everything you need for a calming island stay! The cabin's kitchen is well equipped for everything you need to cook meals, and the BBQ outside is great. What a fantastic home, that really feels more like a treehouse! We were looking for a home away from home for the Victoria Day Holiday (May Long weekend in Canada) and were able to find this spot last minute as it was newly on the rental market. I can tell you I'm sure next year there is no chance we could book this place last minute because it is a magical retreat. You could sit in the home all day and watch the changing view, the home has a perfect view looking west at the Sunset over the San Juan Channel. 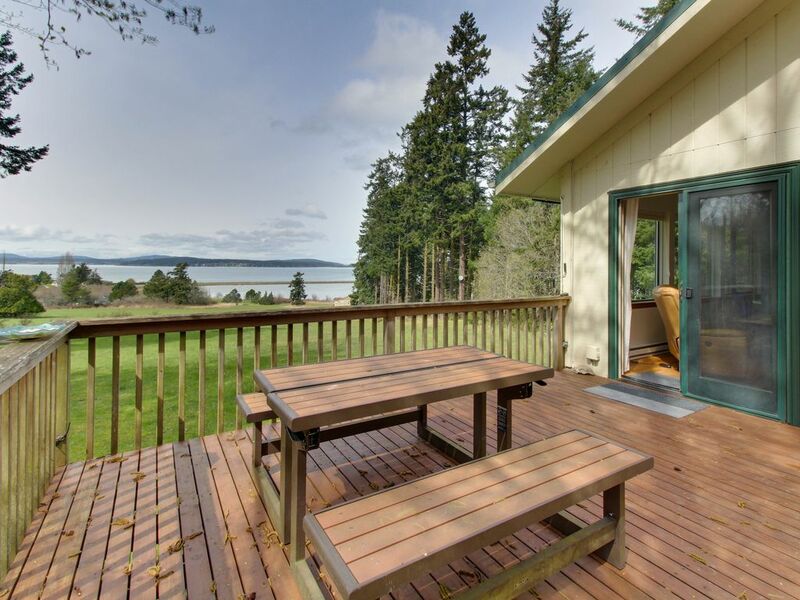 There is an amazing sense of privacy for the home, surrounded by tall trees and only a large open field in front to frame the view over the water. We initially worried about the size of the Murphy bed but it fit two very comfortably. We loved having a kitchen and grill to get to enjoy the amazing fresh produce, meat and seafood of the island. We will be back!